For the past two weeks, I’ve noticed three deer grazing on the lawn outside my office after dark. 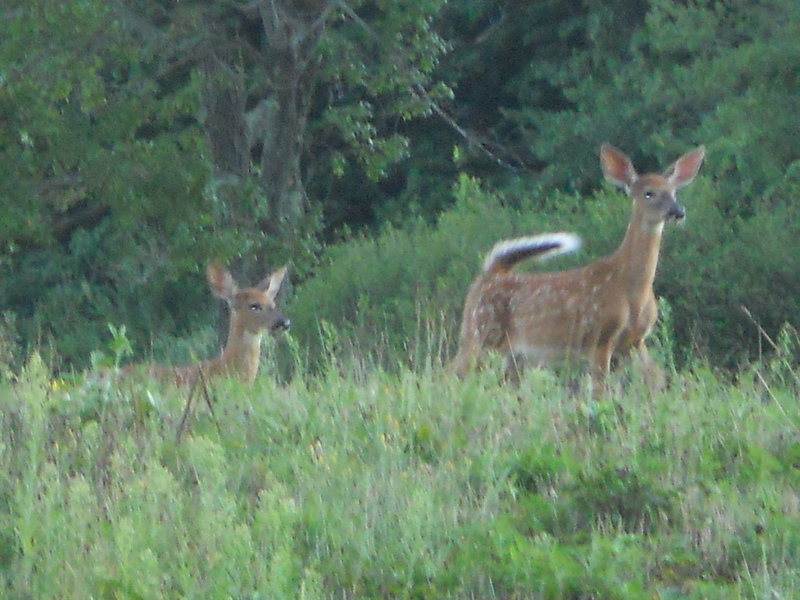 It looks like a doe and two calves, one calf smaller than the other but neither having those white Bambi spots. None of the three have any antlers. They never beat it; they just stand there in profile like marble statues. The summer after I graduated from high school, my friend and I were hanging around with some older boys from town, waiting for summer to end and college to begin. Our idea of fun was to buy some beer and go park on the edge of a big field at night with the truck headlights shining across it. It seemed so innocent and pastoral, with a little classic rock in the background. It also seemed kind of weird, because neither my friend nor I came from “huntin’ and fishin’” families. Her father worked at the nuke plant and my father worked at the paper mill. Both of our dads spent their spare time coaching little league or some other team sport. I don’t remember actually seeing any deer on those long-ago hot August nights, but our summer-before-college boyfriends would stare long and hard out to the place where the light beams ended. I sometimes wondered if they were searching for something besides deer. Maybe they were thinking about their lives and their futures. Maybe they were thinking of their deer stands on a cold Thanksgiving morning. Maybe they were thinking of nothing. I was probably thinking I wanted summer to go on forever, dreading college and the inevitable beginning of growing up. So here I am, many years later, staring at the deer in my headlights, thinking it might be nice to sit in a deer stand for a few hours. I think I might just be a red neck. What signs of spring have you seen this week? This entry was posted in Critters and tagged home. Bookmark the permalink.